Is there a way to run theadb backupcommand on the device itself without using a ᴘᴄ computer ? Of course when I try to do it,adbcomplains the daemon isn’t started and it fails to find a device. You're still doing things incorrectly even though I noted in revision 1 of my answer that you would need adb in PC for once and once alone as long as no reboot or disabling of USB debugging occurs. adb connect localhost:9999 didn't work because you didn't do adb tcpip 9999 from a PC. The said command would set the property service.adb.tcp.port to specified port which in turn is read by adbd when it is started/restarted and used to listen for connections. adb connect localhost:5038 didn't benefit you simply because either you got confused or failed to understand the basics I noted in revision 1 of my answer. First, clear up any confusion. Just because the term daemon is mentioned doesn't mean that it is adbd. A daemon can be for lots of things. A description of protocol between adb clients and server is noted here. A good understanding of how adb client-server-device/emulator communication occurs is noted here. You're requested to read all the documents to gain understanding of how adb works. Now, here are the details for your attempt: When you did adb connect localhost:9999, you actually instructed adb client in your host Android device to connect to a slave running adbd listening on 9999. Your adb client tried to look for adb server on your host Android device. Because it didn't find the server running, it started a server and bound the server to port 5038. Nowhere you instructed adbd to listen on port 9999 or even 5038. You can confirm this with root access. Do su -c 'netstat -natup' and you would find adb not adbd listening on port 5038 after execution of your command. 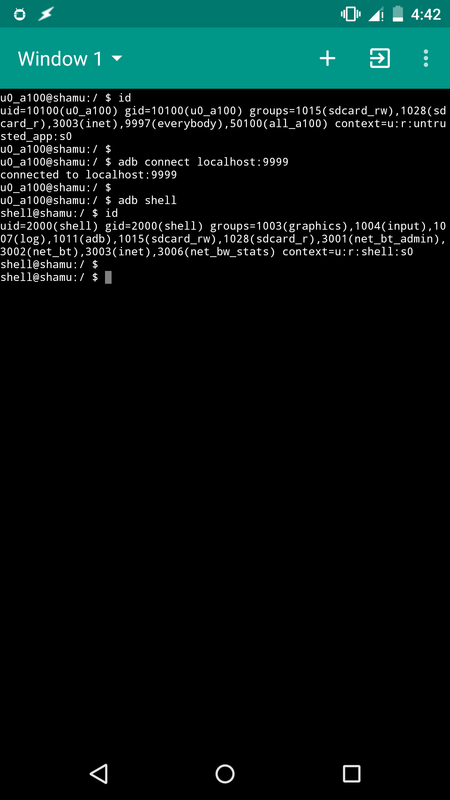 It should now be clear why adb shell resulted in the error. su 2000 -c 'setprop service.adb.tcp.port  PORT'   # choose PORT greater than 1024.
su -c 'stop adbd && start adbd'                   # this would stop and start adbd. su -c adb connect localhost:PORT                        # you shall now be connected and would be required to accept fingerprint to authorize USB debugging. adb is a bridge which helps in communicating with a slave (an Android device) from a client on host machine (typically a PC) through a server running on host machine. A slave has a daemon named adbd which has to running in order for slave to communicate back. 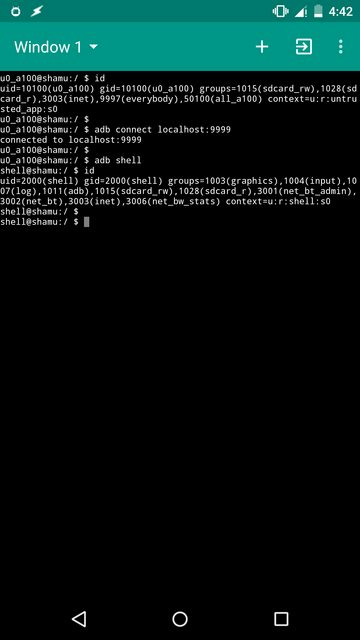 When you attempt to run an adb command which requires an Android device for desired output, the adb server expects a slave connected to host using USB. Since no Android device is connected to your Android device through USB, you get error: device not found. If you connect an another Android device through OTG and have USB debugging activated there, you would/might be able to run adb successfully. At least I was able to. You can now unplug the device. As long as you don't reboot the device or disable USB debugging from Developer options, adbd would continue to run and listen for connection on your supplied PORT. Don't worry about security. While adbd would receive connection from local Wi-Fi network, one cannot successfully connect to your device unless you authorize debugging by accepting their fingerprint. Now you can run your backup command. But honestly, it is not clear to me what you're trying to achieve. If backup alone is the goal, then Helium app might be able to help, although it also requires root access or PC with adb setup. In case you're not aware of this, not all the apps can be backed up using adb. Not the answer you're looking for? Browse other questions tagged adb 5.1-lollipop terminal or ask your own question. Can android device issue adb commants to itself? Can the Galaxy S2 be rooted without increasing the custom flash counter using adb? I am trying to use adb remount and it fails.